Hostel Helvetia will charge a 40% deposit for group bookings by credit card or bank transfer. The remaining amount is paid by a group by cash or credit card on arrival. There is no refund on the booking deposit for a cancellation, no show or reduction in numbers. The reduction in numbers less than 10% is not charged by Hostel Helvetia. A group will pay a smaller balance remained. However, when the reduction is bigger than this, there is no refund on the booking deposit for the persons that will not arrive. We opened its door in July 2005. Since then we have entertained heaps of backpackers from all over the world. We know that among the things they value are our comfortable beds in our private rooms, as well as in dorms, clean bathrooms, wooden floor, Piotr's pictures and the common kitchen, where many culinary pieces of art and friendships were made. The owners are travelers themselves. Both born in Warsaw, Gosia is a writer and Piotr is a photographer. When you enter the hostel, you will be immediately taken to their trips through the picks, words and stories. Our hostel is situated in the city centre in a quiet Sewerynow Street. You will find the beating heart of Warsaw night-life with clubs, bars, cafes and theaters right behind the corner. single travelers, female backpackers, bikers, couples, family with kids, the young ones and those who are young at heart. At our hostel everyone just can feel good. We are waiting for you to bring us your story. 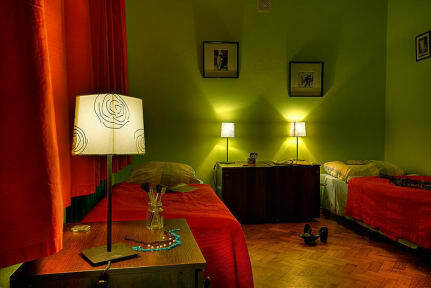 spacious lockers, a socket and a night lamp are assigned to every bed in dormitories, We take a 20 PLN (5 EUR) deposit for the key to the locker, which we return at the check-out. 24 hour reception with amazing, passionate staff speaking Polish, English, Russian, Ukrainian and some other languges. They are ready to help you to guide you to unexplored places in Warsaw, to show where you can eat the tastiest 'pierogi' and have the best local beer. Great hostel, really enjoyed it!